You’re buying or selling a home and your CIA home inspector points out the basement has a crack. Or cracks. Now What? Good thing you contracted CIA, because with our convenient one-stop foundation crack repair service, we.can fix it for you ASAP – and get you right back on track! Chicago Inspection Agency is happy to announce our new service specializing in foundation repair and waterproofing. 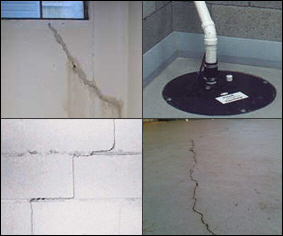 We now provide permanent and cost-effective solutions to one of the biggest problems facing homeowners -: cracked and leaking concrete. CIA’s pressure-injection process of crack repair involves specially-formulated products, which are designed to permanently waterproof cracks in poured concrete foundations. Our longstanding experience in home construction together with quality products assures that you’ll see cracks and foundation leaks gone for good. All work comes with CIA Guaranteed, transferable warranty at no charge regardless of changes in ownership. To schedule an appointment, of get more information just give us a call!